The rodeo is a popular test of a cowboy's skill and even today it has a very large following. I do not know much about this sport as I have only been to one rodeo in my life (and I was less than impressed), but I do know that many people enjoy watching the rodeo and that there are many professionals involved in the sport. 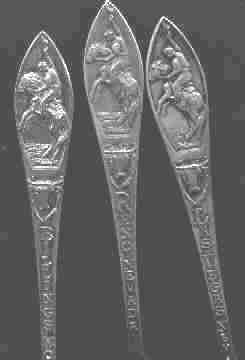 Most of these spoons are from the very first part of this century, and I suspect that the rodeo was a very popular tradition at that time. 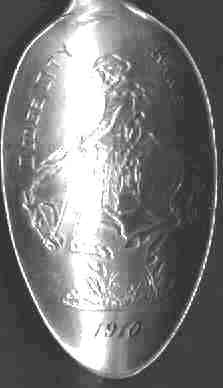 The finial on this spoon is very large and detailed. It is labeled Broncho (sic) Buster. The bowl is impressed with a picture of a cowboy lassoing a steer. It is engraved "Dickinson 4-3-07"
The handle is a conventional North Dakota state design. 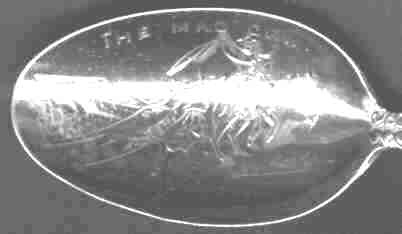 I suspect that this was a "prize spoon"
Sorry, This gold washed engraved spoon bowl is extremely reflective thus the picture is very hard to see. 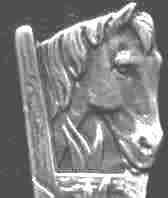 The picture shows a cowboy on horseback roping a cow and the caption is "The Mad Cow". I thought that this was an interesting label. 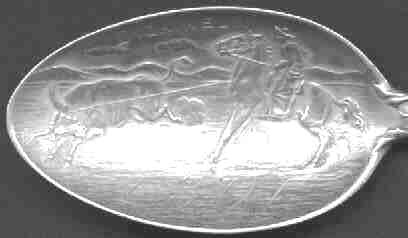 The bowl shows a cowboy on horseback and is engraved "Dodge City 1910"
and probably available with others. These spoons may be of mid-century manufacture. Front and back on a great spoon from Glendive, Montana. 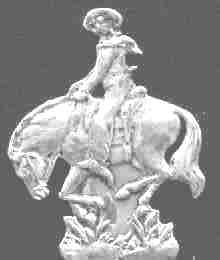 The front features a stagecoach being pulled by horses with an armed gunman hiding behind a bush. 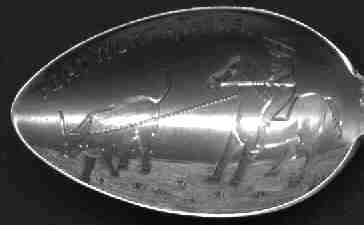 The back features a cowboy roping a cow.